Thousands of print service providers (PSPs) and sign-makers are expected to visit Messe Berlin to explore 700 exhibitor stands, of whom a significant number will be launching new products during the week. Visitors can expect to see the latest innovations in equipment, software, inks and media for screen and digital wide format print, textile printing and signage. Visitors can also access the co-located European Sign Expo for non-printed signage, which this year delivers the biggest event in its six-year history. The event is home to 117 exhibitors, highlighting the latest solutions and tools for channel lettering, neon, LED, dimensional signage, illuminated displays, engraving and etching. Alongside the exhibition, visitors to FESPA and European Sign Expo 2018 can discover a wealth of educational content, live demonstrations and interactive features to see the many opportunities to help their businesses take off. On arrival at Messe Berlin, visitors pass through Printeriors, an inspiring collection of printed interior décor applications. Themed as an airport lounge, Printeriors highlights how print can be used to transform interiors with décor applications such as flooring, wall coverings and soft furnishings. 20 companies have contributed applications to Printeriors including: Mimaki, OKI, CMYUK, Massivit, Premier Textiles and Veika. Also in the atrium of Messe Berlin, visitors can take inspiration from the FESPA Awards display of print and signage projects shortlisted for a FESPA Award. The winners will be announced during the FESPA Gala Dinner on Wednesday 16 May. Visitors to FESPA Global Print Expo 2018 will be able to explore the largest textile presence of any FESPA exhibition to date. With over 120 exhibitors showing textile equipment, substrates and consumables, FESPA 2018 will present a multitude of solutions and applications for print service providers (PSPs) and designers interested in textile printing and production. There will also be a wide range of educational and interactive content for visitors to experience, including FESPA’s new feature Print Make Wear. Visitors to FESPA 2018 will be able to experience, Print Make Wear, an exciting, full end-to-end, design-to-finish production line for fashion and sportswear. 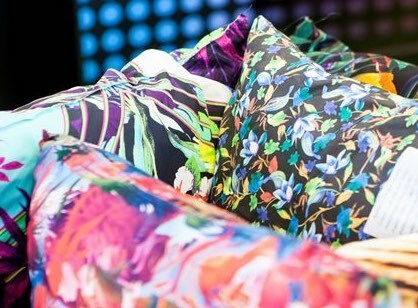 Within the feature visitors can discover all aspects of a textile production line, from creation and preparation to production and presentation incorporating both screen and digital print. Print Make Wear visitors will also find a range of equipment from leading textile manufacturers in action, including a direct-to-garment machine from Brother; colour software from Coloro; Dekken’s new T-Apparel folding machine, a cutting table from Gerber Technology; Inedit digital printing software solutions; Grafco AST screen printing software solutions; a Juki sewing machine; MagnaColours inks; an auto screen carousel from MHM and a manual screen carousel from Vastex, a Mimaki pigment printer and dryers from Adelco, Chiossi and Klieverik. Textiles used in the fast fashion factory will be provided by Premier Textiles as well as Falk and Ross who are providing a selection of shirts, bags and aprons for the direct-to-garment printing machines. Fashion designer, Sanna Annukka of Marimekko, has created a design for garments produced in Print Make Wear, using a combination of Pantone spot colours, metallic and special effects, which will be printed live daily on MHM’s oval automatic screen printing press. Other textile focused exhibitor highlights announced to date include: FESPA 2018 Corporate Partner, Dover Digital Printing (hall 2.2, stands 8.5, 9.5, 15.5 and 16) who will be demonstrating a full production workflow for the creation of customised football jerseys. Dover Digital Printing’s sportswear factory will showcase products from Dover Digital Printing brands: Caldera, MS Printing Solutions, JK Group, Monti Antonio and Zund. The factory will highlight the entire production process, from initial design through to printing, cutting and sewing. Other exhibitor highlights announced to date include the first showing, at a FESPA event, of Epson’s Monna Lisa industrial textile press. Epson will also present a haute couture womenswear collection by fashion designer, Richard Quinn, and all of the items will be printed on Epson’s SureColor SC-F series printers. Another new visitor feature to launch at FESPA 2018 is the Digital Corrugated Experience (hall 5.2 – upper level), which demonstrates the commercial and production benefits of digital print for corrugated packaging and retail display applications. Targeted at both PSPs and converters, the feature hosts 17 exhibitors to illustrate the new revenue opportunities that can come from adding digital printing for packaging to their existing production technologies. Visitor favourite, the action-packed World Wrap Masters (hall 6.2 – upper level) vehicle wrapping competition, takes place over the four days, beginning with the European Series (15 and 16 May) and followed by the World Wrap Masters Final (17 and 18 May), where visitors can watch top installers from around the globe compete to become World Wrap Master. Visitors considering vehicle wrapping as a diversification path can attend free daily workshops to learn from wrap experts. During the event, FESPA will share the headline findings from its Print Census 2018, through daily Trend Theatre briefings, hosted by Ron Gilboa of Keypoint Intelligence. He will examine the main trends, focusing on how these have changed since the last Print Census in 2015 and what these findings mean for FESPA’s global print community.